Allow me to introduce you to Cheyene. Most grandbabies have dogs, cats, hamsters, gerbils, etc as pets. Something you don’t have to worry about the splat effect while playing fetch. Not mine. They have 3 tarantulas, 1 lizard and a roach colony to feed them all. YUM! I have learned more about all three than I ever thought I’d know. Fascinating. Tarantulas molt and as they go through this process what is left behind is the intact shell of the creature. My grandson places what’s shed in small acrylic cases and has them on display. They really are quite mesmerizing. You have to make sure the tarantula is well fed before the molting begins because once they complete the process you cannot feed them until their skin toughens up again. A cricket, or roach, can cause fatal damage to the tender, freshly molted body of these creatures. Experts say this is a “very difficult and strenuous experience for your pet spider”. 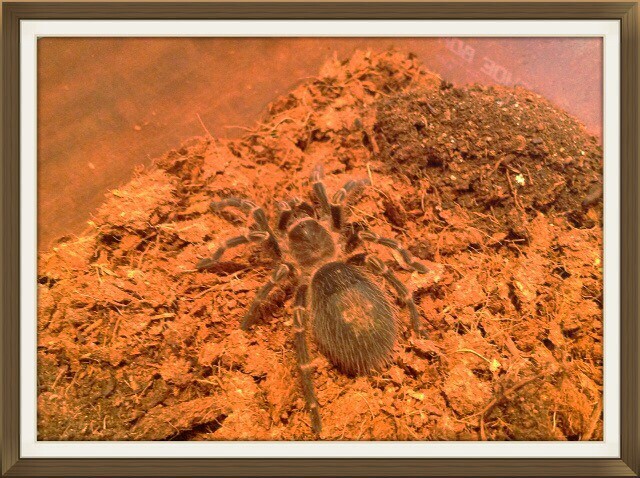 One of the tarantulas likes to hide her shed skin as if a prize possession. She drags it off to her burrow for safe keeping. There is an interesting parallel there to our walk of transformation. 2 Corinthians 5:17(AMP) Therefore if any person is [ingrafted] in Christ (the Messiah) he is a new creation (a new creature altogether); the old [previous moral and spiritual condition] has passed away. Behold, the fresh and new has come! And yet it is so easy to tuck away our “old man” for safe keeping. Pulling out those old thoughts, behaviors, attitudes, convictions is just as easy as pulling chocolate chip cookies from the cookie jar. Or glancing back in admiration as if viewing a prized tarantula molting in a display case. Dear fellow Believers, this ought not be so. Galatians 4:9(ESV) But now that you have come to know God, or rather to be known by God, how can you turn back again to the weak and worthless elementary principles of the world, whose slaves you want to be once more? As Believers, when we go through the molting process it is for our growth, the expansion of our faith, correction of our path, etc. Sometimes it’s an easy fix and other times, as with the tarantula, is can be a “very difficult and strenuous experience”. Either way, if we yield to Gods purpose His glory will shine through. We will not only be victorious, we will benefit from the transformation. May we all find ourselves “molting from places we didn’t know we had” and, as we molt, may we find ourselves resting in the Lord, looking forward to His purpose in our transformation and the new revelation of who we truly are. Great spiritual truth from the teacher of nature.